Many summer camps now posted. New camps added daily, please check back! USA's wide range of camp options ensures we have a soccer camp to suit players of all abilities and age groups. Options include Classic Soccer Camps, Specialist Camps, and High School Camps ensuring whatever your soccer needs are, we have you covered. Not sure which is the correct soccer camp for your child? Call us at (732) 563-2525 or use the chat function on our site, we're here to help! Classic soccer camps provide players a rounded soccer experience covering a broad range of soccer techniques, skills, and tactics. Players will be challenged at an appropriate level while receiving instruction in a fun, positive environment. USA's flagship soccer camp which offers the complete soccer experience for all levels of play. 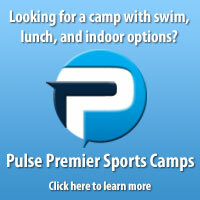 Pulse Camps feature unmatched facilities typically including swimming, lunch options & headline instructors. The next step from Soccer Squirts with added emphasis on skill development & a tactical introduction. Often imitated - never duplicated. The #1 introductory soccer experience. A fun soccer introduction through discovery and educational games all with the help of Mom or Dad. Specialist Camps offer an intense and effective training experience giving players the opportunity to concentrate on the improvement or reinforcement of a specific aspect of their game. It's just you and the coach. Individual soccer instruction customized to your needs. Intense ball skill development for the serious soccer player. Nothing but shooting & scrimmaging on this goal scoring camp. No pressure, just play! Weekly summer class focused on gameplay. Work on all aspects of the position from technique to tactics. Attend camp as a team with a dedicated trainer focused on just the needs of your team. High School camps are the perfect pre-season preparation for players about to embark on their fall H.S. season. Attend our H.S. Camp as a team for comprehensive tactical experience plus scrimmage opportunities against other schools. Our sister company, the US Sports Institute, allows us to offer a wide variety of other sports camps.